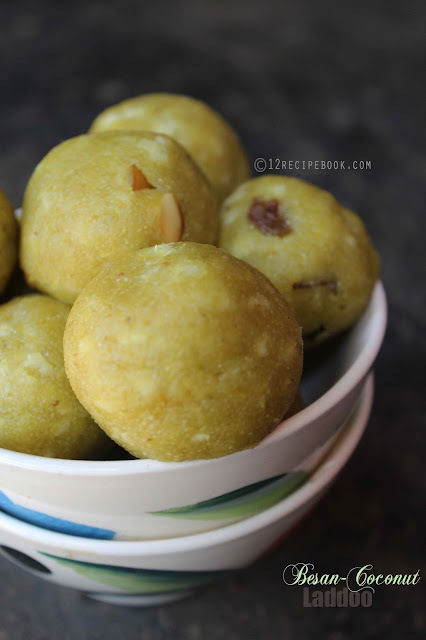 Besan flour Coconut laddoo is a delicious sweet which can be prepared within minutes. This can be made on any festive occasions or as a weekend treat! Dry roast the grated coconut in low flame for 3-4 minutes without changing its color but turns crisp. Keep it aside. Heat a heavy bottom no-stick pan with 1 tbsp of ghee. Add besan flour into and roast continuously on low flame for about 15 minutes or until the raw smell goes out and besan flour slightly changes its color (stir well without burning; any slight burning; spoil the entire taste). Add roasted coconut and mix well. Add sugar and allow to melt them; then the mixture will be slightly sticky. Add milk and stir well without any lumps (use a hand mixer to ease the process; at very low flame). When it starts to thicken; add ghee and mix well. Cook until the mixture dries out well and starts leaving from the sides of the pan clearly. Switch off the flame and sprinkle cardamom powder and fried nuts. 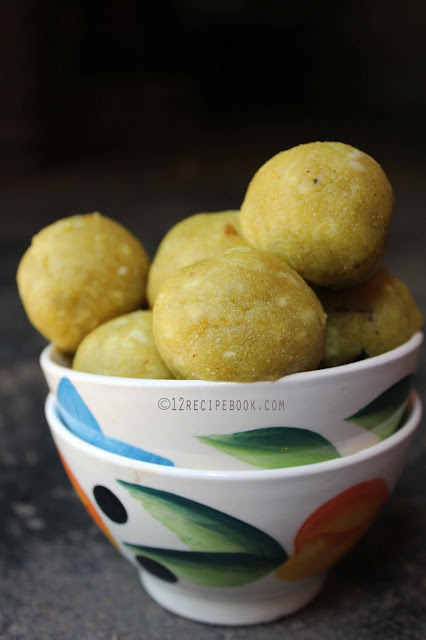 Take small portions from the mix still it is warm and make laddoo's out of it. Serve and enjoy the delicious bite!! You can store them in an air-tight container up to one week in room temperature.